The National Fastpitch Coaches Association began as a way to help college softball coaches assemble best practices when the sport was catching serious momentum in the mid-1980s, and it’s obvious how the solid roots of the past have led to a flowering and productive organization today. With more than 5,700 members and representation from all 50 states and 11 foreign countries, the NFCA presses on with a relentless itch to share information and insight. It’s the kind of thoughtful conversation that helps inform coaches and excite players regardless of age and experience; if there’s a strategy or scheme or theory worth considering, the NFCA has tools to help you build a plan. 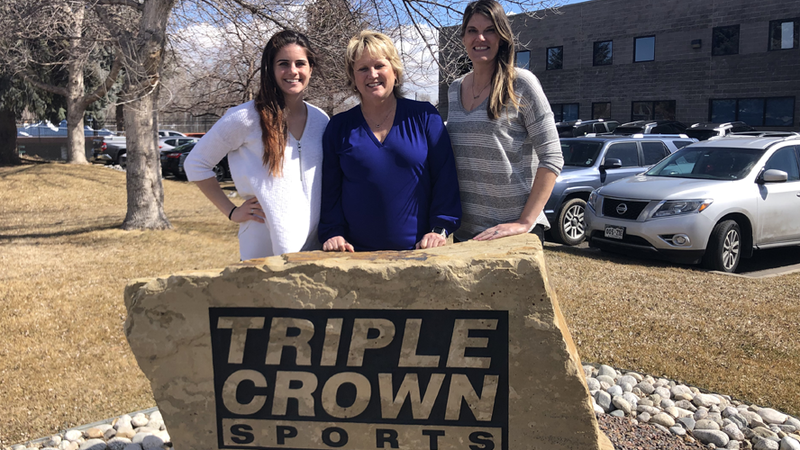 Triple Crown Sports was lucky enough to have the NFCA swing through the office in late March, and we sat down with Carol Bruggeman (Executive Director) and Emily Allard (Marketing and Sponsorship Specialist, Travel Ball Coordinator) to talk about the sport as it stands in 2019. Q: In what was a surprise to many people, the softball community seemed to broadly agree that the days of getting college commitments from 13-years-olds had to end. How did you feel after the NCAA banned active recruiting of players before the start of the junior year of high school? Carol: We’re very proud of that fact, and for not only the 14u group but the 12u group. The whole community knows; it wasn’t only a softball issue, but softball was on top of the list in terms of the youngest age of the earliest commits. 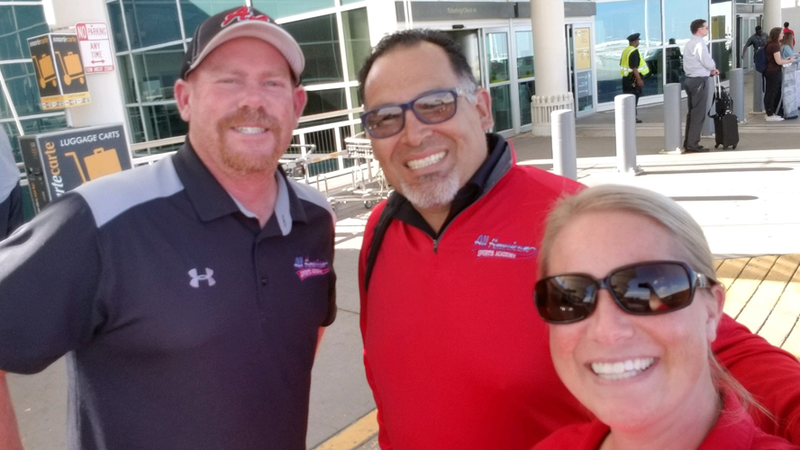 It was exciting for us to see the softball community come together: high school coaches, travel ball coaches, colleges at all levels, parents and players. We had a lot of players come forward on video and say they were in favor. We tried to hit it from all angles. For years and years, people said there was no way to change it, no way to legislate it. But the powers that be took it as a challenge. I give credit to Samantha Eckstrand, our legal counsel, a lot of credit. And to Joanna Lane, our director of education and D-I liaison, who coordinated a lot of those efforts. The community came together and said, we have an issue. It’s not great for 12- and 13- and 14-year-olds to be making decisions about college. Nobody liked it, and it got done pretty quickly to be honest. Emily: Everyone took a sigh of relief; a weight was lifted off most importantly from the kids’ shoulders, but also the coaches. A lot of them felt they were in this agent role between parent and players and college coaches. Everyone stepped back and remembered why they were in the game in the first place … to focus on teaching again as opposed to getting these young kids recruited. They can get back to coaching them and helping them be not just the best players they can be, but the best humans they can be as well. Q: There’s plenty of competition for the attention of athletes; what’s the approach the NFCA has for the continued growth of the sport? Emily: Our community in general is such big sharers; everybody loves the spot and is invested in it and in giving back. We talk in the office a lot how the legends in our game are still coaching; having this open forum where everyone is willing to share for the betterment of the game. We’re still pretty new; this association is just 35 years old, and it’s fun to see everyone come together, especially for the education. That’s what the NFCA is here for, making sure anyone involved with parents and players has the right knowledge, and the good x’s and o’s … to get them credible information so they are able to pass it along. Carol: That’s our challenge every day, to make sure we are keeping softball out in front and being innovative. It starts with the players – they have to have fun with their first experience with softball, or they will go to another sport. How do you have fun, have a good time? You need a good coach. That coach makes it a great experience, and that’s where we come in. We want to educate the coaches; make sure they can show that passion and teach the game. As it moves along, our coaches can continue to grow with education. We have various touchpoints – podcasts, webinars, clinics, a convention, classes – I could go on and on. Depending on what level you are on, we have something for you. We’re always trying to innovate. One of the things we did this year for high school travel ball coaches is an exclusive Coaching Tools Package. It’s a practice plan, and that’s what these coaches want. How can I implement something, and how can I get my hands on it right now? Every year you are a member, you get a fresh set of plans and videos that are just for our grass-roots members. We also have a Charts Package – 25 charts that high school, travel ball, college coaches would love to use. That’s been very well received, and the cool thing is all those charts came from member coaches. Q: Softball will be played in the 2020 Olympics in Japan, but it’s off the board again for the 2024 Games in Paris. It puts a real crimp in the hopes of pushing fastpitch further than the NCAA championships, agreed? Emily: I remember growing up and watching the (2008) Olympics, and I wanted to be Jennie Finch and play at Arizona, and I saw it – it brought me to the pro league. Young girls having those roles models, who look and talk and act like them, it’s exactly what our sport needs. We have to what we can to help the game grow internationally so we’re not on the bubble every time, and finding a way to get the pro league to be where we all want it to be. It starts with us. If people want to see softball grow at the highest level, they have to support it. Carol: A kick in the gut. For four different Olympiads we were in, with no issue. We were out, now we’re back in for 2020, and in 2024 we’re going to be out again. We’re hoping in 2028 we’ll be back in, since it’s in Los Angeles and we’ll be hosting. Unfortunately, as popular as softball is in the Americas, the Asian countries and Australia, in the European part of the world it’s not super popular. We have partnered with the European Softball Coaches Association to help them educate their coaches and grow the sport. The more we grow it in Europe, where there’s the majority of the voting power in the International Olympic Committee, the better. USA Softball is doing clinics all over the world, trying to make sure fastpitch softball is considered down the road. But it’s a kick in the gut; it affects people being able to play after college. Our pro league continues to battle and try to get on track and grow; this year there are a lot of international teams in the pro league which is great, but I do worry a bit about what that means for the pro league down the road when we aren’t in the Olympics. We support the pro league, of course. We have to keep doing what we can to educate coaches not only in this country but globally, so softball can sustain its success and make it a no-brainer to be in the Olympics. 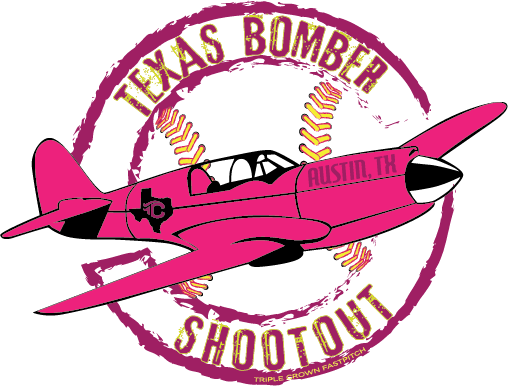 More than 75 teams will use the TCS Bomber Shootout this weekend to spark the fastpitch season to life. The sold-out tournament (featuring teams from Texas, Oklahoma and even one from Colorado) is based in and around Austin, TX and brings out teams in the 10u, 12u and 14u age groups. The 2019 edition is the 19th running of the event; Triple Crown started its official partnership of the tourney with the Texas Bombers in 2015. The 14u Gold champion last year was Diamond Sports Hotshots/Nelson, who got past Glory Adkins Gold, 3-0. Weather sidelined the 12u Gold bracket, but the Silver was won by SA Angels ARod, who beat Texas Glory 2024, 5-1. At 10u, the Bombers CTX was the last team standing after an 8-4 win over Texas Glory 2K7. There are multiple Texas events still available – next up is the June 7-9 Texas State Championships, which will be held in the Metroplex (Allen/Plano/McKinney). The July 18-21 Southwest Summer Nationals is packed with extra dimensions, including camp workouts with University of Texas coach Mike White. 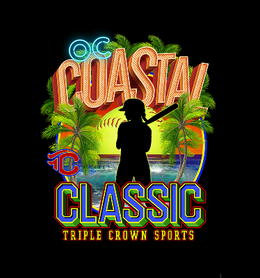 Nearly 150 teams took some serious swings at the OC Coastal Classic, a top-notch Triple Crown fastpitch event in SoCal that included games at the new Great Park facility in Irvine. 18s at Great Park – The SoCal Athletics ran the table, winning six games, but they were tested in the finale, just slipping past Firecrackers-Brashear, 2-1. The Athletics allowed just eights runs over the course of the tournament. 18 Open – OC BatBusters-Bracamonte was super tough in the circle on Sunday, winning three games and eventually the title, thanks to a 6-0 victory over Firecrackers-Kimura. The Bracamonte squad allowed just one run Sunday. 16s at Great Park – Nobody swung the bats quite like the Corona Angels-Howard team, which plated 28 runs in three games Sunday to claim the crown. Runner-up OC Tigers Lastrapes played well under pressure, winning 5-4 and 3-2 to reach the championship game. 16 Open – SoCal Athletics Marinakis/Fox came through with a tight 4-3 victory in the title game over Ohana Tigers-Herrera/Halleen. The Athletics did not allow a run in three pool play games, then started Sunday with a tough 2-1 victory over Firecrackers-Brashear/Duarte. 14s at Great Park – Sunday was one to remember for Athletics-Mercado/Tidd, who started with a 4-1 win and then used two nail-biters (5-4 and 7-6) before getting to the finale, where they topped Utah Fastpitch-Korth, 10-6. It was a rematch from pool play, where the teams battled to a 2-all tie. 14 Open – A 39-team division battled it out with Breakers Labs Black polishing off a long day with a 3-0 victory over American Pastime-Velasquez/Farnworth. Breakers Labs allowed five runs in five games but showed ability to hit when needed, slipping by SD Brashear Mata/Garcia by an 8-7 margin in the quarterfinals. 12 Open – Relentless work in the circle paved the way to the title for Power Surge Berndes, which allowed two runs in pool play then posted victories of 6-0, 8-0, 10-0 and 6-0 on Sunday. 10 Open – SoCal Choppers-Franco came through pool play with three wins, 22 runs and zero runs allowed; Sunday was more of the same. The Choppers won 10-0 and 8-2 to reach the final, and they eased past Synergy Fastpitch by a 12-3 margin for the crown. 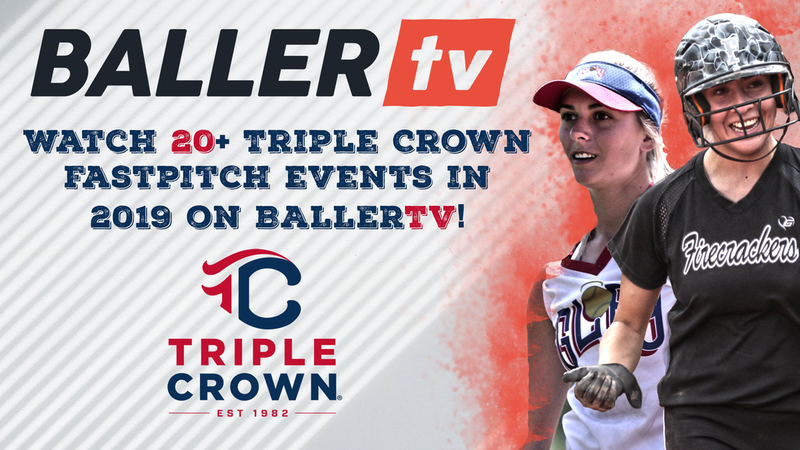 ​FORT COLLINS, Colo. – Triple Crown Sports has entered into a multi-year agreement with BallerTV that will add livestream video coverage to more than 20 Triple Crown Fastpitch events, beginning in 2019. On a softball field, there’s a lot that can happen – accurate pitches, solid hits, speeding fielders all playing out backed by a soundtrack of claps and hoots, with the loudest of cheers and the quietest of strategy-centric whispers filling the gaps. That’s key, really, the space a softball field makes available for anyone who wants to cross the lines. And not only can young women simply take pleasure in playing a game, but they can find encouragement to seize an opening in their own lives. When it’s really clicking for the Oregon Blaze fastpitch program, based near Portland, the sport of softball is more than an arena for breaking a sweat. From its start in Beaverton nearly 30 years ago, when Jim Marron and Lynn Buerer held a tryout and got blitzed by nearly three dozen 8-year-olds showing up, to today’s high-achieving crew of about 12-15 squads depending on the season, the Blaze wanted to solve problems and be a force for physical and personal development. “In 1989 my daughter was born; she played T-Ball at age 6, and at age 7, Lynn Buerer and I decided it was time to even the playing field with softball. We called ourselves the Angels the first year; 35 kids showed for the first tryout,” Marron said. “We thought, we can’t leave all these kids out here and we wanted to give them an opportunity to play this great game. Next year, we formed the Beaverton Blaze, two teams, 10A and 10B. Most players were age 8 and 9; we wanted to maybe play a couple years and then be ready to function as a more competitive organization. Mic Bowman, coach of the 18 Gold and 16 Gold feeder squad, got involved in 2000 when the softball world he saw lacked stability and focus. Sensing a huge opportunity was being frittered away for his daughters, Bowman immersed himself in the sport and relied on his enthusiasm for the game to provide what he couldn’t pull off because of experience. “Around 2000, our Little League (softball) was having political issues, and I decided I didn’t want to be the parent who just complains, so I did something about it. I spent six months, literally, watching videos,” Bowman said. “I taught myself how to pitch, I went to pitching clinics, and I got familiar with travel ball coaches in the area … call it a six-month crash course on all things softball. When my oldest daughter was 9 or 10, I started coaching. Oregon may sound like an athletic outpost, but the quality of softball players from the area continues to impress. For the Blaze, it begins with patience and a welcoming vibe in the early ages and is fortified with a desire to keep parents, players and coaches mindful of the long-term goal. That goal might include a college scholarship, but the Blaze wouldn’t want to focus exclusively on that result. 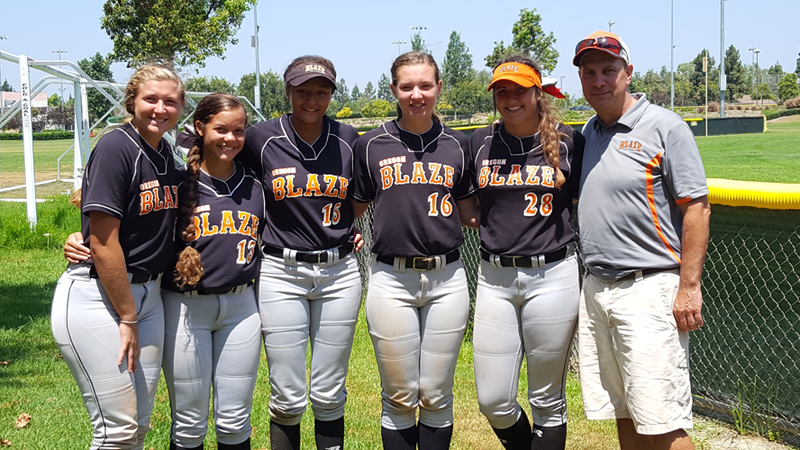 With that foundation, the Blaze moved ahead and started to address the gap that existed in terms of experience and game savvy with competitors from softball hotbeds like California, Texas and the Southeast. Some of those matchups didn’t end up well in the younger age groups (that’s not a shock, given the state might get four months of solid sunshine a year), but as players got older, the differences at 16u and 18u began to shrink. In fact, that’s one reason why the Blaze is enthused about recent changes in college recruiting, because an Oregon player may look a bit green and unrefined at age 12 or 14. Another dose of competition and seasoning is exactly what the talent in Oregon thrive upon. And in that thriving, the deeper usefulness of the sport can emerge. “With competitiveness and things like that … it’s not the goal, but a means to achieve the goal. The ability to have enough confidence in yourself that no matter how many times somebody has told you what you have to do, you can figure out the right thing and then do it,” Bowman said. “The willingness to put in the work, to sacrifice, to see that if I spend three nights a week in the gym during January, it pays off in April and May … doing the grunt work to be ready for the glory. It’s a lesson that applies for everyone. 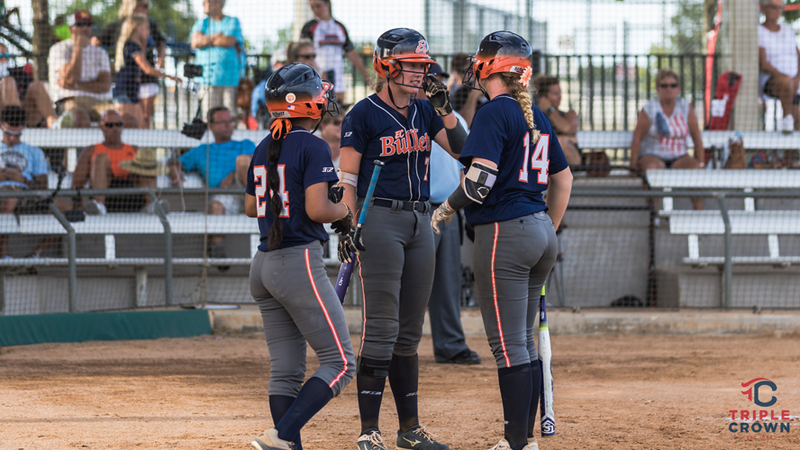 The modern age of softball is not short on challenges to the aspirations of the Blaze – some years, that aforementioned hunger for scholarships can wobble a team’s focus, and there are parents who lack that certain “off” switch when it comes to behavior in the stands. But the positive results and meaningful changes within the players are much more plentiful and memorable. “Every collection of players is different. We’ve had times with a group of players that was so focused on the recruiting side of things that is was very difficult to get any cohesion … those are years where we might win a lot of games, but it’s still very frustrating,” Bowman added. “Or we may have a group that plays together wonderfully as a team, and they don’t win as much because they are not as talented. It’s true – my motivation is to teach the kids, to allow them to express their passion for the game at the highest level they possibly can. Up in the corner of the country, the Oregon Blaze knows the right angle to take. One reason fastpitch teams came running to the start of the Triple Crown Super 72 NIT hinged on what was waiting at the finish line. This past weekend’s event in Chicago offered a paid berth to the winners of each age group into TCS’ 2019 Fourth of July championships in Colorado – the 14u champ getting a ticket punched for Sparkler Juniors, while the 16u and 18u champions were added to the Fireworks roster. Not for the first time in a tough Triple Crown event, the Iowa Premier had an outstanding run in the brackets, claiming the 14u and 16u titles. And in the 18u division, the Chicago Cheetahs were the last team standing. 14u – The Iowa Premier were overpowering on offense, posting wins of 13-5 and 10-6 to reach the semifinals in Sunday’s bracket action. The Premier then eased past the Indiana Gators, 8-0, before prevailing in the final with a 11-7 win over the Beverly Bandits Premier Futures. That Futures team had defeated Iowa Premier earlier in Saturday’s box bracket play, 3-0. 16u – This Iowa Premier team made its way through the opposition more on defense and the ability to stay cool when things got tight on the scoreboard. On Sunday, a 4-3 victory over Batbusters KB was followed with a 4-3 win versus the Lemont Rockers, setting up a championship showdown with the New Lenox Lightning. The Premier had the answer, with another 4-3 victory. 18u – The Chicago Cheetahs scored 17 runs and gave up one in two wins in the box bracket; they followed up with 9-0 and 11-0 victories to reach the semifinals in the championship bracket. Sunday saw the Cheetahs top Iowa Premier, 8-4, and then in the final the Cheetahs cranked up the offense again, topping the New Lenox Lightning, 10-7. In the heart of the nation, all the ingredients are available to grow remarkable, durable products. You just have to know the environment that provides so much also throws up challenges. Turns out the proper care and feeding of softball players also produces spectacular results in the Midwest, and there’s no better example than the one found with the Iowa Premier program, based in Des Moines but capable of providing bracket-busting ripple effects from coast to coast. 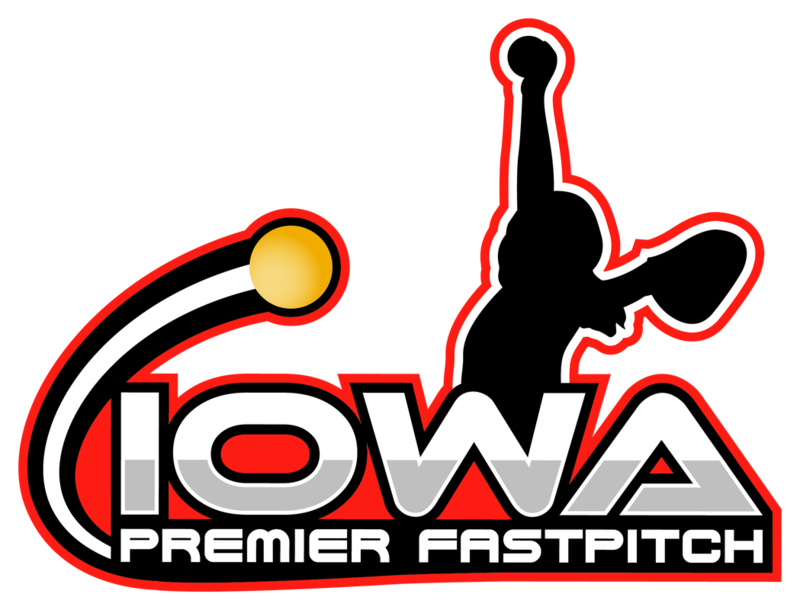 Founded by Greg Dickel in early 2014, Iowa Premier now consists of nine teams (12u-18u) and is a flat-out talent pipeline to college fastpitch programs. Dickel’s daytime task for 27 years has been as a full-time police officer in Des Moines; he played baseball in high school and junior college and took interest in fastpitch when his daughter Paige took up the sport as a 7-year-old. Eventually, Dickel became co-director of another Iowa academy and after a few years decided to put his own vision on the field. Presented with that opportunity, he’s been determined to give Iowa’s best their own chances to break new ground. “It’s been a definite mission to build an organization that gave best players in Iowa a national stage, together on the same teams, which would create opportunities to be seen by college coaches for potential scholarships,” said Dickel, whose teams have a long list of victories in ASA, PGF and Triple Crown championship events. “Our mission has always been to take the very talented Iowa-based player and help showcase their skills and play with the other top players. We now have 20 kids from Illinois who play with this club, five from South Dakota who have traveled in, two from Minnesota and Missouri, and all four corners of Iowa. With that underlying priority, it’s clear Iowa Premier wants to groom standout student-athletes, but it’s another thing to actually do it. The proof resides in the laundry list of college signings and the presence of terrific talents, including pitcher Kaitlyn Menz (a sophomore in Wisconsin who was an all-Big Ten second team selection) and Kendyl Lindaman, who you can expect to see on Team USA rosters one day after her freshman season at Minnesota – she was the Big Ten freshman and player of the year and named a first-team choice for the NFCA All-American team. “Greg was tough on me as a coach, especially as an 11-year-old, but that’s what needed. I needed someone to push me to be the best player I could be,” Lindaman said. “He saw a lot in me that other people didn’t, and I respect him so much for doing that for me. It was getting that push; that’s what he gave me. The Iowa Premier has had to tackle stellar competition while facing one very unique uphill obstacle, with the state’s high school season running from early May through July and thus playing out in direct conflict with the typical club softball slate of events. It’s a monster topic on its own, but coping with the scheduling challenges just makes success on a national stage all the sweeter for the Premier. “It’s very rewarding; the biggest reward for the organization and the people involved is we had to go out and earn our stake. Not a whole lot of people gave us respect early on,” Dickel said. “My reputation as a coach allowed us to get some invitations to see what this Iowa Premier thing was all about, as the IClub teams (Dickel’s previous organization) had some success. I had developed some relationships; you need to know some people to get started, and we did well. Things started to build ... the PGF was a big hurdle, and our 2015 18 platinum team lost in the final. Mark Mulvaney, owner at president of Scout Softball (a scouting agency that collects film and data, and is designed to easily connect college coaches and athletes) has long been impressed with the brand of athlete Dickel uncovers in the nation’s breadbasket. “We ran a showcase in St. Louis that drew six or seven kids from IClub, who turned out to be a bunch of future college players. Greg saw the need for an established organization dedicated to travel ball, and might have gone against the grain with how summer ball works in Iowa,” Mulvaney said. “He saw the need for it full time. Got his team with Iowa Premier, and soon he had all D-I kids, not just four or five. We made effort to go to the Midwest, and we saw great kids who knew they were being ignored. These are 5-foot-8 to 5-foot-11 girls hitting it out of the park. The opportunity began to present itself, and they took advantage. There’s a dollar investment in that conversation, but it’s probably more relevant how Iowa Premier coaches apply the resources of time and attention. Coach Kevin Stephens joined the staff after long conversations with Dickel about how a program can best serve the player and creates a roster of competitive but conscientious teammates. Dickel certainly wishes the whole high-school/club season conflict could be worked out, but after multiple petitions and conversations, he’s not getting his hopes up. It’s not unusual for Iowa Premier players to be facing off against each other in a state final, only to be shoulder to shoulder in California for a big club tournament.